and the mornings have a chill to them, I begin to wonder when that first snowflake will fall. I love that the mornings are darker and that I can slip outside and revel in the darkness knowing that dawn is just around the corner. The skies have been overcast, thwarting my plans to shoot the Draconid meteor showers that peaked this past Thursday. As the clouds scudded by one could occasionally see a patch of stars in the night sky and I was at least lucky enough to see four meteors. The hours between sunset and sunrise have become my favorite hours to shoot. If you haven’t tried it I would encourage you to go out and soak it up. There is a meditative quality about these hours. The tranquility and lack of interruptions is something that I don’t usually find in my daylight hours and that outweighs those brief moments that intrude when I hear a branch snap or see a bat fly by. This morning I reflected on another loss to our small community that occurred when a Cessna crashed into Round Top mountain killing two pilots and leaving the third passenger, at this point in time, unaccounted for. I suppose that it could be said that they died doing what they loved but for those left behind I am not sure that is enough of a consolation and my heart goes out to them. I grew up being afraid of the dark so find it empowering that I can now be out in it; finding enjoyment in searching out the photographic opportunities it has to offer. 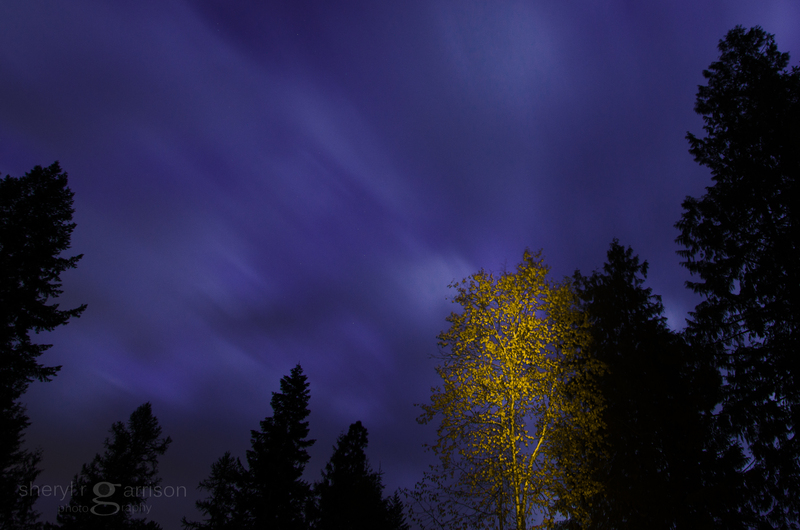 Although I’ve shot this birch tree before it never occurred to me to try it at night and now I wonder… what took me so long? Beautiful shot, and wonderful write-up. Your after dark shots are fascinating, Sheryl, and beautiful.